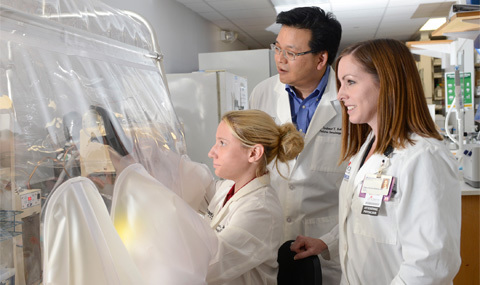 Research assistant Laura Coughlin, seated, Dr. Andrew Koh, and Dr. Tiffany Simms-Waldrep use an anaerobic chamber as part of a study investigating how the gut’s bacteria defense system fights off Candida albicans infection. In the study, published online in Nature Medicine, scientists identified how a certain transcription factor – a protein that that turns genes on and off – works in partnership with a naturally occurring antibiotic to kill infection-causing fungi called Candida albicans. These particular fungi, best known as a cause of yeast infections and oral thrush, can be lethal if they overgrow and invade the bloodstream from the gut. At high risk for this type of infection are stem cell transplant and leukemia patients whose immune systems are suppressed during treatment. Up to 25 percent of cancer patients develop bloodstream infections from bacteria or fungi. “For a cancer patient with a Candida bloodstream infection, the fatality rate is about 30 percent. Candida is the No. 1 fungal pathogen,” said senior author Dr. Andrew Koh, Assistant Professor of Pediatrics and Microbiology, and a member of the Harold C. Simmons Comprehensive Cancer Center at UT Southwestern. Certain antibiotics do fight invasive Candida infection, but they are not always effective and antibiotic resistance increasingly has become an issue. Dr. Koh’s research team aimed to uncover how the body’s natural immune defense system might be enhanced to fight a Candida infection. About half of the population carries Candida in the gut, where the yeast is usually harmless. When the organism overgrows, it may leave the gut and cause infection. Commensal bacteria, the resident bacteria of the gut, normally defend against disease by inhibiting growth of potentially pathogenic organisms. By studying how mice infected with Candida responded in different scenarios, the researchers discovered how to enhance the body’s natural ability to eradicate infection, in this case Candida. Specifically, the researchers found that enhancing the transcription factor HIF-1α with L-mimosine led to increased production of the natural antibiotic peptide LL-37, which in turn killed the fungi. L-mimosine is a natural product derived from seeds of the koa haole tree that is not approved as a drug but is known to boost HIF-1α activity. The study also suggested that certain gut bacteria – Cloistridial Firmicutes and Bacteroidetes – may be important in producing short-chain fatty acids that help fight infection. More study is needed to pinpoint the optimal method of inducing the body’s gut defense system, whether through use of an agent like L-mimosine or by administering short-chain fatty acids such as vinegar. Study lead author Di Fan formerly worked in Dr. Koh’s lab. Other contributing authors were Laura Coughlin, research assistant in Pediatrics; Jiwoong Kim and Minsoo Kim, computational biologists in Clinical Sciences; Dr. Xiaowei Zhan, Assistant Professor of Clinical Science and in the Center for the Genetics of Host Defense; Dr. Tiffany Simms-Waldrip, Assistant Professor of Pediatrics and member of the Pediatric Hematopoietic Stem Cell Transplantation Program; Dr. Yang Xie, Associate Professor of Clinical Science; and Dr. Lora Hooper, Professor of Immunology, Microbiology, and in the Center for the Genetics of Host Defense. Dr. Hooper, a Howard Hughes Medical Institute (HHMI) Investigator, holds the Jonathan W. Uhr, M.D., Distinguished Chair in Immunology and is Nancy Cain and Jeffrey A. Marcus Scholar in Medical Research, in Honor of Dr. Bill S. Vowel. The research was funded by the National Institutes of Health, the Howard Hughes Medical Institute, the Roberta I. and Norman L. Pollock Fund, and a Global Probiotics Council Young Investigator Grant for Probiotics. UT Southwestern’s Harold C. Simmons Comprehensive Cancer Center includes 13 major cancer care programs with a focus on treating the whole patient with innovative treatments, while fostering groundbreaking basic research that has the potential to improve patient care and prevention of cancer worldwide. In addition, the Center’s education and training programs support and develop the next generation of cancer researchers and clinicians. The Simmons Cancer Center is among only 30 U.S. cancer research centers to be named a National Clinical Trials Network Lead Academic Participating Site, a prestigious new designation by the NCI, and the only cancer center in North Texas to be so designated. The designation and associated funding is designed to bolster the cancer center’s clinical cancer research for adults and to provide patients access to cancer research trials sponsored by the NCI, where promising new drugs often are tested.